An exhibition charting the influence of Hampstead on John Constable opens today to mark the 200th anniversary of his first visit to the Heath. 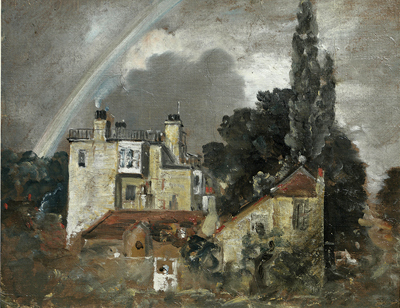 ‘Constable: 200 years in Hampstead’ (until April 7, 2013) at Burgh House, New End Square, London NW3 (www.burghhouse.org.uk), will display several of his works on loan from the V&A ‘just steps away from the views that inspired them’. Despite his association with Suffolk, Constable’s major works the ‘six-footers’ exhibited at the Royal Academy-were executed in his London studio, and he rented a succession of homes in Hampstead, which enabled him to escape the smoke of central London. It was there on the lofty, wind-blown heaths that he began ‘skying’-making sketches of the effects of clouds and light. Trees have closed off many of the vistas he delighted in sketching, although the huge grassy hollow just below West Heath was one of his favourite locations, inspiring such works as Branch Hill Pond. A few doors down from Burgh House, 40, Well Walk was one of Constable’s residences and his grave is in the pretty churchyard of St John’s, Church Row. The exhibition includes works by other Hampstead-based artists, such as C. R. W. Nevinson, Donald Towner and Duncan Grant.